I adore that kind of nerd nonsense, and I’ve never had any problem accepting superhero comics for exactly what they are, but it took even me a second to accept what was happening in She-Hulk 162. It’s actually a rather delightful issue, as Mariko Tamaki and Jahnoy Lindsay take an insightful look into Jennifer Walters’ trauma and recovery, but both the methods and the speed with which they do so require quite a bit of suspension of disbelief. The issue finds Jen finally going to see Flo Mayer, her psychiatrist/stalker, who helps her unpack her trauma with some sort of magical metaphor pill. This gives Lindsay a chance to go wild, first drawing Jen as just a floating head (representing her anxiety and the way she’s been trapped in her head since her accident — also represented by her omnipresent internal monologue, which Flo forces Jen to shut off) and later showing Jen quite literally putting herself back together when she finally gets a chance to confront her own issues head-on. 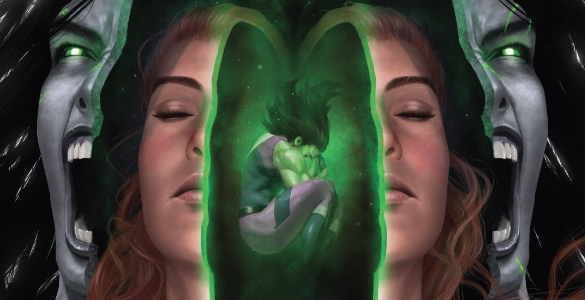 First Jen confronts her new Hulk transformation, admitting how the loss of control it represents scares her, and the Hulk, in return, admits that Jen’s fear frustrates her to no end. Next Jen gets to face her greatest fears, first by finally putting a fist through Thanos’ face, and then by releasing all her pent up sorrow over Bruce Banner’s death before finally coming to terms with it. It’s creative, it’s insightful, it’s cathartic, and at the end, Jen is her old self again — classic green She-Hulk form and all. As I’ve said, I adore all of this work, it just takes some extra effort to accept. First of all, Flo is more plot device than character (what does she get out of this? Didn’t earlier issues imply that she wanted to write about Jen as well? ), with her magical metaphor pill and possible telepathy going completely unexplained. More importantly, it’s a potent, sudden change in Tamaki’s pace. Throughout this run she’d been treating Jen’s recovery with a slow, gentle touch, showing it to be a long journey that she may never fully complete. It was a fairly realistic take, while Jen’s recovery in this issue is as comic book-y as it gets; sudden, full, and complete in a way real life therapy never is. I get the feeling that Tamaki was given instructions from editorial to wrap this new direction up as quickly as possible so as to return Jen to her classic status quo. If so, I’d say Tamaki executed her task better than she ever really could have been expected to, and I don’t mind meeting her halfway. The payoff may be a bit sudden, but it’s worth putting in the work. Thought: She-Hulk is a B-Lister. Maybe C-Lister. She barely supports her own comic and putting her on a team probably doesn’t make that book sell more (or even at all, really. How many people are going to go buy the US Defenders because She-Hulk joins 3 other heroes?). Anyway B-List characters need to change more than A-listers. Makes sense: You’d better put out Spider-Man stories that feel like Spider-Man when you’re following Dan Slott and whoever wrote Spider-Man before Slott (I can’t remember off the top of my head, which says something about Slott). And this STILL doesn’t feel like a She-Hulk story. It’s a good story and I enjoyed it, but it’s a noticeable departure from Soule or Byrne when she was Sensational or Kraft when she was Savage or Parker when she was… red (which was awesome by the way). So that’s good. I feel like this whole arc has been a metaphor, but now I’m not sure for what. Green is good, that’s when she’s in control and has power and she lost her power because Thanos almost killed her (which symbolized… abuse?) where she turned gray and through therapy and a metaphor pill she’s green and recovering her power? I don’t think it is necessarily a thing about B-list character needing to change more than A-list characters. Ultiamately, I think all characters nee dot change until a creator comes along and looks something in that is unique and works. Like how Hawkeye was kind of directionless until Fraction essentially defined Clint Barton, as a modern example. And I think She-Hulk found that unique sellign point pretty early on, as a quirky lawyer comedy. But just as sometimes you need to have Doc Ock take over Peter Parker’s mind, sometimes you need to do something to create a unique, one off tale with She-Hulk. ANd I think, especially at the start, this series did a great job at that. I also think it has struggled a bit, trying to rush back to this point because things weren’t as well received as Marvel hoped (despite the amazing writing). Which is a shame, because as much as I love the quirky lawyer comedy side and think it is an element that should be developed, I really enjoyed this digression. But speed really seems to be a problem here. There is a lot to praise – i especially love how both Jen and Grey Hulk get time in the spotlight to express their issues. And there is something funny about Jen being turned into a giant talking head in the ultimate talking heads issue. But it really suffers by being too quick. Dealing with trauma (the way I see Thanos, he isn’t abuse, but trauma. PTSD, yes, but abuse it specific in a way that I think is inaccurate) can’t be resolved so easily, and I would have loved to see the therapy sections be at least an arc, if not threaded between multiple arcs. Or, at th every least, an issue that took place over a significant period, with a series of sessions. I wish that Marvel would incorporate Jen into the pages of Amazing Spider-Man. I feel that she can relate to Peter Parker as part of his supporting cast whereby she’s there to help him out in a non super heroine role and vice versa. If Jennifer got to know Peter, they would hit it off very well.